There’s nothing better than winning a prize with a dog you have either bred yourself or purchased and trained in one of the variety of canine sports available to the enthusiast. However, much is handed over to a breeder to purchase a well-bred puppy there is no guarantee that the dog will achieve top honours. It is common to have paid in excess of one thousand pounds when buying a dog from a well-known and well-respected breeder. To some this is an exorbitant amount of money, to those in the know it is the norm. You must remember the work and care that has gone into breeding the litter. The breeder has not just put two dogs together and produced puppies, reputable breeders have studied bloodlines, followed health plans relevant to their breed and acted upon any problem that arose. They would have exhibited their stock, winning stud book numbers and making up champions to show that their kennel name bred sound stock and was a name to be proud of. You may have purchased your puppy with the idea of entering a canine sport. It may have been the show ring that appealed to you or perhaps agility, obedience, flyball or dancing to music the choice is so varied. Whatever the reason, you cannot appear in the ring or arena without having put the work in before hand. However much you paid for the puppy it still needs to be trained. Even before you have picked your dog you should have read everything possible on the breed those appeals to you and the sport you wish to follow. A win to some is failure to others! Some people are aiming for the top in their sport whereas many people are happy to have been placed in their class and spent a nice day out with their dogs and friends. We all have different objectives. It stands to reason that the top people in the breed will often win, they have the stock, the expertise and the years of experience and contacts. Don’t get upset if you are beaten by others, look at every competition as a learning curve and enjoy the experience. There is much store placed on food today whether it be school dinners or family meals. The same can be said of feeding our dogs. To produce a fit prime example of your breed you will need to look at what is fuelling this winning machine. Some people prefer a natural diet and there is a big following of the Raw Meaty Bones (RMB) diet and the Bone and Raw Food diet (BARF). If you can follow these plans you will know that your dog is getting the best possible start in life. There again you may be happy to use too many ranges of complete foods on the market, the choice is yours, but please do the best for your dog that you can. Training should start on day one. To begin with lead training at home until he has had his vaccines and can venture into the wide-open world. If you intend to show him then get him used to being stood correctly and having his ears, teeth and feet felt by other people just as a judge would do in the ring. Also get your dog used to being groomed by laying him down on a table, or the floor and brushing him through thoroughly – even if the coat is short. These small practises will pay dividends once you get into competition. Sadly not every puppy grows into a swan. 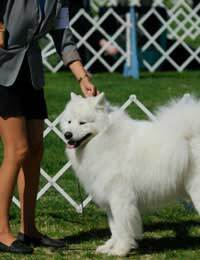 If you are showing the dog he may not quite have the proportions needed for a show specimen. This does not stop you trying other canine sports, the choice is so varied. Enjoy your dog for what he is – a member of the family – anything else is a bonus. Not everyone can own a champion dog – it would make a mockery of the system if we did! But the main thing to remember whether your dog won a top award or a rosette for fifth place – or even walked away with nothing; we always take the best dog home!